Wednesday, October 31, 2018 - His Grace Bishop Irinej of Eastern America, joined His Eminence Archbishop Demetrios of the Greek Orthodox Archdiocese of America, and His Beatitude Metropolitan Tikhon of the Orthodox Church in America, among other Orthodox hierarchs and clergy, together with other distinguished religious leaders in the Park East Synagogue, in a memorial event titled “United Against Hate,” an inter-religious gathering of Leaders in solidarity with Pittsburgh and the victims of the massacre at the Tree of Life Synagogue. 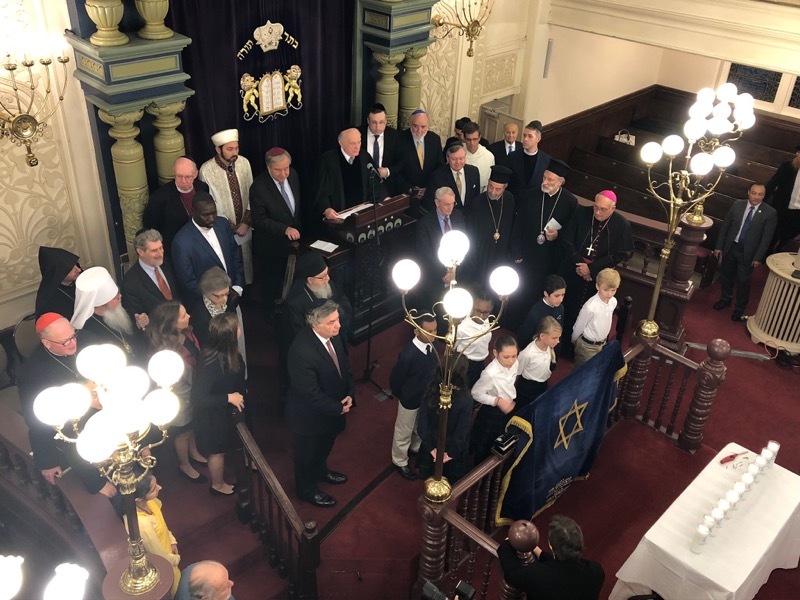 “This is a gathering of brothers and sisters coming and sitting together in peace,” said Rabbi Arthur Schneier, himself a holocaust survivor, who led the event and is the founder of the Appeal of Conscience Foundation and Senior Rabbi of the Park East Synagogue, cosponsors of the event. Secretary General of the United Nations Antonio Guterres, who spoke next, mentioned the growing number of incidents of anti-Semitism and the alarming signs of neo-Nazism, xenophobia and racism. Following the Secretary General and offering messages of condolence, solidarity and peace were Archbishop Auza, the Papal Nuncio and Permanent Observer of the Vatican to the United Nations; His Eminence Timothy Cardinal Dolan, the Roman Catholic Archbishop of New York; the Rt. Rev. Clifton Daniel III, Dean of the Cathedral of St John the Divine; the Very Rev. Archimandrite Daniel (Findikyan), Diocesan Primate for the Eastern Diocese of the Armenian Church of America; Sheikh Musa Drammeh, Chairman of the Islamic Cultural Center of North America; and the Consul General of Israel in New York, Ambassador Dani Dayan. Also present at the gathering were other religious leaders, political and diplomatic dignitaries, law enforcement members and community representatives. Young Jewish students donning “United Against Hate” T-shirts opened the event with a musical tribute, “A Prayer for Peace” and concluded with “God, Bless America”.